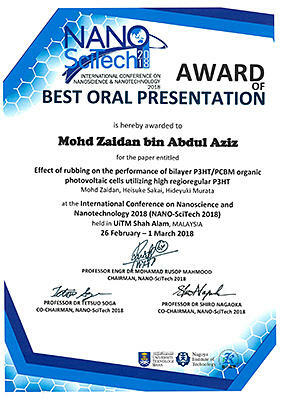 HOME > ［News & Events］ Mr. Mohd Zaidan Bin Abdul Aziz, Applied Physics Area, received Award of Best Oral Presentation in NANO-SciTech 2018. Mr. Mohd Zaidan Bin Abdul Aziz, Applied Physics Area, received Award of Best Oral Presentation in NANO-SciTech 2018. 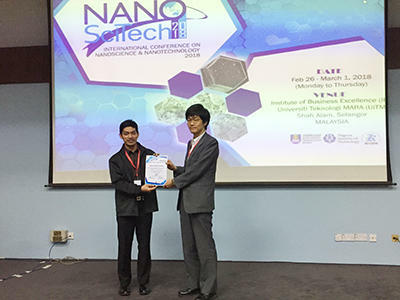 Mr. Mohd Zaidan Bin Abdul Aziz（3rd year doctral student in Murata Lab of Applied Physics Area）received Award of Best Oral Presentation in The 9th International Conference on Nanoscience and Nanotechnology 2018 (NANO-SciTech 2018). The 9th International Conference on Nanoscience and Nanotechnology 2018 (NANO-SciTech 2018) was held in Institute of Business Excellence (IBE), Universiti Teknologi MARA (UiTM), Shah Alam, Selangor, Malaysia on February 26 - March 1, 2018. This conference serves as a platform for the experts' interaction with simultaneous networking opportunities and also provides potential linkages to explore the innovative ideas of the participants from different regions over the world. It aims to discover the advances, practical experiences and innovative ideas on issues related to Nanotechnology as well as a breadth of other topics. The Award of Best Oral Presentation was presented based on the way and contents of the oral presentation. Effect of rubbing on the performance of bilayer P3HT/PCBM organic photovoltaic cells utilizing high regioregular P3HT. My research involves the fabrication of bilayer organic photovoltaic (OPV) devices with the use of rubbing technique on conjugated polymer layer. The active layer materials for OPV devices consist of the conjugated polymer [e.g. poly(3-hexylthiophene-2,5-diyl) (P3HT)] as a donor material and fullerene derivative [e.g. phenyl-C61-butyric acid methyl ester (PCBM)] as an acceptor material. The effect of rubbing on the performance of bilayer P3HT/PCBM organic photovoltaic cells utilizing high regioregular P3HT was presented. This research work involves the rubbing process on high regioregular P3HT films [>98 % regioregulariy (RR)] that have resulted in the formation of rougher surface of the films as compared to that of unrubbed film. The sequential deposition of PCBM layer on rubbed P3HT layer induced the larger P3HT/PCBM interfacial area, resulting in more efficient charge transport at the inter-diffusive bulk heterojunction layer. These changes have resulted in the increases in photovoltaic characteristics of rubbed bilayer P3HT/PCBM devices, enhancing the power conversion efficiencies from 2.86 % of unrubbed device to 3.22 % of 10 times-rubbed device. I am grateful to God and honored for being selected as a winner of the Award of Best Oral Presentation at International Conference on Nanoscience and Nanotechnology 2018 (NANO-SciTech 2018). It was a once in a lifetime opportunity for me to present my research work in my home country. I would like to express my heartiest gratitude to Prof. Hideyuki Murata and Asst. Prof. Heisuke Sakai for their continuous supports and guidance throughout my research works. Also, many thanks to the staff of JAIST Educational Service Section, organizing committee of NANO-SciTech 2018 and all members of Murata Laboratory for their kind assistance and supports. I wish to join this kind of international conference again in the future if there is such opportunity.